At the 2013 Esri International User Conference (Esri UC) in San Diego, California, innovator and seven-time Grammy Award winner will.i.am inspired a packed room of 13,500 geospatial professionals by extemporaneously speaking of his conviction that maps and GIS can be stepping stones that help advance K–12 education—a view that is a natural adjunct to his philanthropic i.am.angel Foundation that supports science, technology, engineering, and mathematics (STEM) education in the classroom. 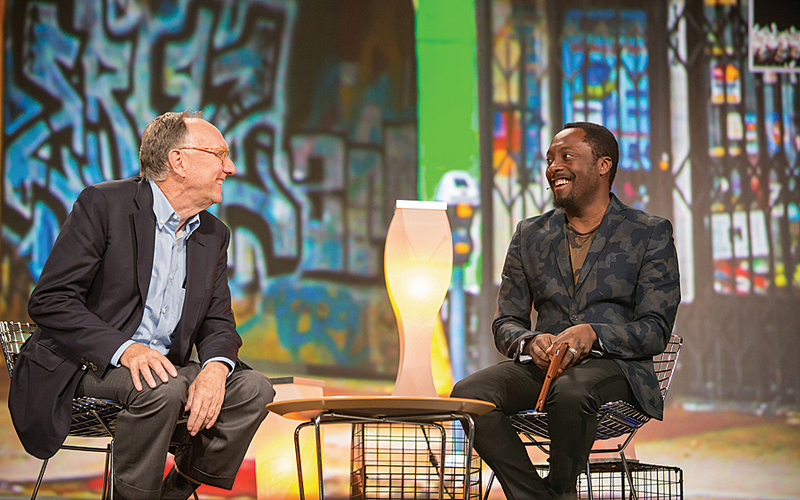 Jack Dangermond and will.i.am talk about technology education and inner city programs. 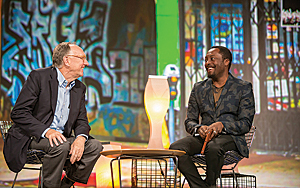 Jack Dangermond spoke one-on-one with will.i.am, born William James Adams, at the Esri UC Plenary Session about his passion for helping young people get a strong STEM education, including learning to use GIS. Their 30-minute conversation followed a demonstration of mapping projects by four 11th graders from Roosevelt High School in the Boyle Heights neighborhood of Los Angeles, California. [See video.] will.i.am grew up there and now supports the community and the students through the i.am.angel Foundation. He helped arrange for the students to use ArcGIS for their school projects after meeting Dangermond and seeing the technology in action. The foundation chief of staff, Enrique Legaspi, said GIS is an innovative tool for kids to better understand the challenges in their neighborhoods. "GIS maps are part of a new feature of education—getting students to think critically, collaborate meaningfully, and ask the right questions to design real solutions using GIS technology," Legaspi said after the students finished their presentation. will.i.am followed up on that theme. "The maps are really like a filter. They filter information for you to make better decisions on where you are going and what to do. I want to thank the GIS community for opening the doors and transforming these kids' lives with these tools." He also challenged GIS professionals to get involved with both his efforts and their own schools to improve the skills that only GIS can deliver. will.i.am, who said he plans to study computer science starting in the fall, emphasized that in a world that now uses technology so much to communicate, it's important to be tech savvy and computer literate. "Most people don't read or write code, but we all use technology to communicate," he said. Gini Connolly, the GIS manager from the City of Hurst, Texas, took will.i.am's message of promoting a STEM education to heart. "will.i.am was pretty neat with what he's doing," Connolly said during a visit to the i.am.angel Foundation exhibit, where maps from the students' projects were displayed. "He's a change agent." She was touched by his story about growing up in Boyle Heights, a predominantly Latino working-class neighborhood in East Los Angeles, and his desire to help the youth pursue their education and dreams. "He's humble," said Connolly. "Our eyes kind of welled up." For more information, visit the i.am.angel Foundation.